Schefflera species are wonderfully tropical plants. The larger schefflera (sometimes called the umbrella plant) features long, shiny, oval green leaves that droop gracefully from a central stalk. A mature schefflera might have 12 or 16 leaflets from a single stalk, while an immature schefflera is more likely to have 4 or 6. Schefflera arboricola (sometimes called dwarf schefflera) feature smaller, glossy leaves, sometimes with creamy variegation. Schefflera will thrive alongside your other tropical plants. Sadly, schefflera is unlikely to bloom inside, so you'll miss the long, red tentacles that pass for flowers. Light: Bright, indirect light. In the summer, move it outside if possible under a shady overhang. Water: Schefflera appreciate a lot of humidity and moist compost. Water weekly during the growing season and spray frequently. Cut back water during winter. Temperature: They suffer below about 60ºF. Do not expose to drafts or dry heating vents. Repot annually as needed. A mature schefflera can grow into a small tree, up to 12 or even 15 feet tall. However, it's more likely that an indoor plant in a temperate clime will stop growing around 6 feet. Slow the growth rate by prolonging repotting. 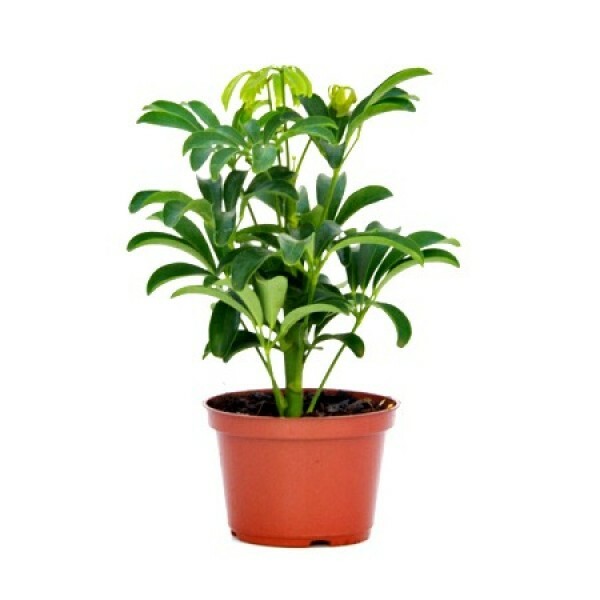 Schefflera are not difficult plants to grow, providing you supply plenty of indirect light, warmth and humidity. In very cold climes, bottom heat might be necessary. Leggy schefflera can be pruned to encourage a more full plant. An underwatered, cold schefflera will begin to drop leaves quickly, so take leaf-drop seriously and move to correct the problem. If you lose all the leaves, but you want to save the plant, move it outside in the spring, give it lots of water, and it should leaf back out.